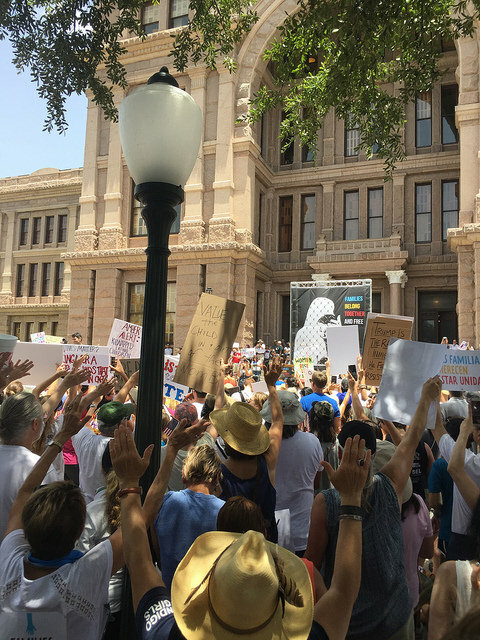 10,000 in Austin rally to ‘Keep Families Together’; Many Texas victories to celebrate. Carlos Lowry /The Rag Blog. 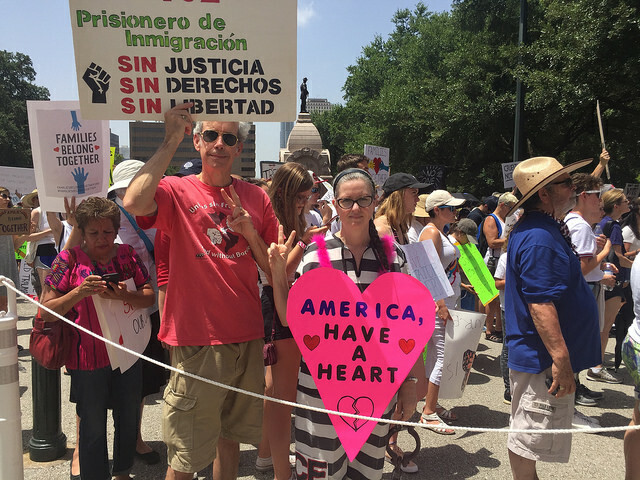 On Saturday, June 30, 2018, a Keep Families Together rally at the Texas State Capitol drew about 10,000 people. With heat reaching nearly triple digits, crowds gathered at noon on the Capitol steps to demand reunification of separated families and justice for asylum seekers. Sulma Franco, a Guatemalan asylum seeker addressed the crowd in Spanish recounting her nine-year struggle for asylum. 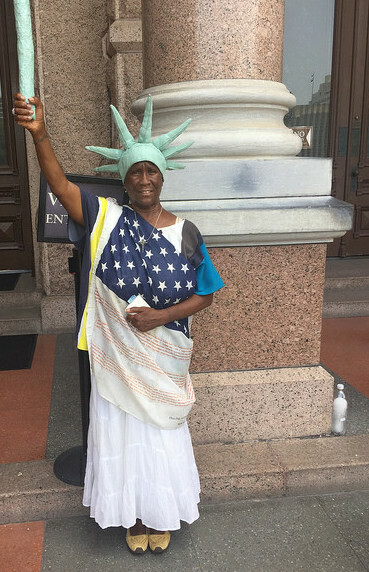 She was incarcerated at four detention centers and received sanctuary for several months in an Austin church before being granted a stay of removal. Two immigration attorneys spoke of the ordeals their clients faced. Some had their children separated “for photographs or baths” never to return. The Austin event was one of 750 in the nation, every state represented. There were similar rallies in many Texas locations, including Houston, Dallas, San Antonio, El Paso, and Rio Grande Valley sites. The Austin coalition organizing the event included Austin Sanctuary Network, Indivisible, Democratic Socialists of America, Children’s Defense Fund, ADAPT, United We Dream, the Texas AFL-CIO, and other groups that coalesced quickly to respond to the immigration crisis. 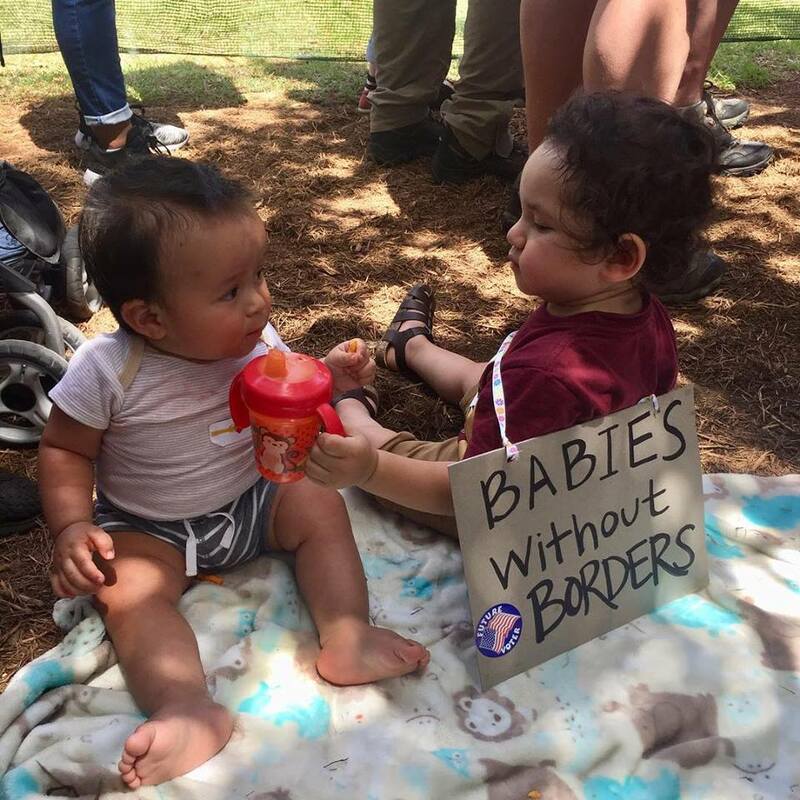 Austin rally against immigrant family separation, June 30, 2018. Photo by Carlos Lowry / The Rag Blog. I am not alone in feeling overwhelmed by the onslaught of Trump policies. And Jeff Sessions. And the Supreme Court. I am not alone in needing a news detox. I am not alone in needing a news detox. The talking heads of cable news (the channels I watch) have almost entirely abandoned investigative reporting, relying instead on the tired banter of expertise and opinion, all conducted within the narrow parameters of partisan electoral politics. I am not alone in facing the limitations of aging. What meetings require driving at night? What demonstrations require parking at great distances? What amount of heat can I stand for how long? Along with my peers, questions of “How far? How long on my feet? What heat index?” determine our participation. Meanwhile, children are packed into buses and moved far from the Texas border. A local non-profit gorges on the detention business of housing unaccompanied minors and now toddlers and infants who were accompanied. It seems almost indulgent to spend the time to write about all this for The Rag Blog. But, it seems important. In part, because the only survival skill I can find that works these days is to not feel that I am alone. I am surviving off the power of organizations of people similarly alarmed, mobilizations, demonstrations, and campaigns that can chalk up a few victories. So, let me focus on a few victories. Feminism is, in fact, alive and well. Feminism is, in fact, alive and well. I am thrilled to be part of a Feminist Action Committee of Austin’s Democratic Socialists of America (DSA). Almost everyone is young. They have energy. They swim like dolphins in the sea of new technology that often baffles me. They table events. They show up. This spring, for the third year in a row, our committee went bowling. The bowling was mediocre, but the Bowlathon for Abortion Access was a rousing success. Our local committee raised $8,000 this year. As one DSA chapter effort among many, we could feel the power of a coordinated national campaign that raised $80,000! A victory worth celebrating. 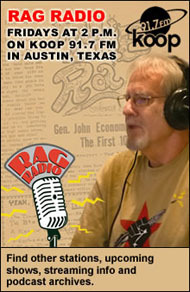 Listen to the Rag Radio interview on reproductive justice. Lady Liberty at Capitol. Carlos Lowry / The Rag Blog. The DSA Health Justice Committee has an ongoing campaign, canvassing 5,000 doors to talk about Medicare for All and the Austin Paid Sick Days Ordinance. After visits to the Austin City Council, phone banking to get folks to lobby City Council, filling the chambers, and testifying until 1 a.m., the City Council passed the first Paid Sick Leave ordinance in the South on February 16. It was a major victory. It was a beautiful win, worth savoring. Legislators and state officials have signaled they will fight the ordinance. But, a Travis County state district judge recently struck down an injunction that had been filed against the ordinance. 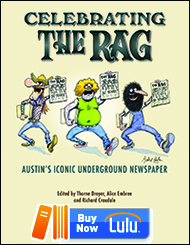 Listen to the Rag Radio interview on the Health Justice Campaign. Then there was Williamson County on Tuesday, June 26. A spectacular coalition that included Grassroots Leadership, Austin Sanctuary Network, Wiliamson County (Wilco) DSA, and other groups brought 200 people to the Williamson County Courthouse for the Jericho March: Tear Down the Walls Dividing Families. After marching around the courthouse, the crowd filled the courtroom where an immigrant detention center item was to be heard. The County Commissioners in conservative Williamson County voted 4-1 to cancel their contractual relationship with T. Don Hutto, the immigrant detention center that houses women in Taylor, Texas. It was a victory, sweet to savor. The California Court injunction on family separation came the same day, directing the urgent reunification of young immigrant children with parents and setting out a timetable for reunification of all separated children within thirty days. For those of you who need more substance than slogan on the issue of family separation, Mike Siegel, Democratic candidate for Texas Congress in District 10 has a statement on his position that is an excellent, well informed, and short read. And also brewing is criticism of Southwest Key, the Austin nonprofit that is enriching itself and its CEO in the big business of child detention. In front, activists Jim Turpin and Heidi Turpin at Austin rally. Photo by Carlos Lowry /The Rag Blog. Southwest Key Programs is at the center of the cruel policy of separating children from parents on the Texas Rio Grande border. The Trump administration “Zero Tolerance” policy has criminalized people seeking asylum and resulted in the separation of parents and more than 2,000 children. Baby and child detention has become big business, and federal dollars are pouring into Southwest Key facilities. Since 2015, Southwest Key has won at least $955 million in federal contracts to run shelters and services for immigrant children in custody. The President and CEO of Southwest Key Programs, Juan Sanchez, and his wife, Jennifer Nelson Sanchez, have benefited personally. Juan Sanchez was paid $1.5 million in 2016, his salary doubling from the prior year. His wife, Jennifer Nelson Sanchez, vice president of Southwest Key Programs, was paid $262,000. These salaries are staggering when compared with non-profits of similar size. According to their website, “Southwest Key Programs does not support separating families at the border.” Then, it should not be complicit in that policy; it should not grow its business off that policy. And Juan and Jennifer Sanchez should not line their own pockets with obscenely high salaries off cruel policies that separate children from their parents. In Houston, Mayor Sylvester Turner has gone on record saying he doesn’t “want to be an enabler in this process” of building a Southwest Key “tender age facility” in his city. State Senator Sylvia Garcia, who represents the Houston area, also opposes the Houston facility. Call Southwest Key Programs at 512-462-2181 and tell them to get out of the business of detaining infants, toddlers and children. For my many peers who are unable to make meetings or go on marches, I urge you to make a phone call a week or a small donation a month. Sustain the work of groups that are organizing resistance. Indivisible Austin puts out a great event calendar along with suggested scripts and phone numbers for contacting elected officials. Democratic Socialists of America, Grassroots Leadership, and Workers Defense Project need you as well. And you can keep the shows going on Rag Radio and the blog posts on The Rag Blog going by pressing the donate button above the Rag Blog banner, or clicking here. There have been many victories. Celebrate them. Above all, don’t get isolated in despair. That would be following the Trump agenda. Read more articles by Alice Embree on The Rag Blog. 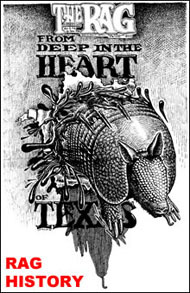 This entry was posted in RagBlog and tagged Alice Embree, Austin DSA, Family Separation, Immigration, Keep Families Together, Rag Bloggers, Texas Activism. Bookmark the permalink. Thanks, Alice, for the information and perspective. Modifying participation comes with guilt so I appreciate the suggestions for alternate actions. Our youth give me hope in the not news/only op ed era of non-truth. I hope they can stop the national slide toward facism. Hello. I am working on a research project involving the American Institute for Free Labor Development and the ongoing debate in labor over it. I am trying to document the work of the Emergency Committee to Defend Democracy in Chile and the publication it put out “Our AFL-CIO Role in Latin America”. I spoke with Fred Hirsch recently but he is suffering some serious memory issues. Do you know anyone who was involved in that group in the 1970s? There are references to the AFL-CIO’s role in newsletters of NICH (Non Intervention in Chile) and in the NACLA (North American Congress on Latin America) Newsletter. Where are you located? I live in a suburb of Mpls/Stp. I have a lot of info about the AFL’s role in Chile. I am looking for info about the debate about that. 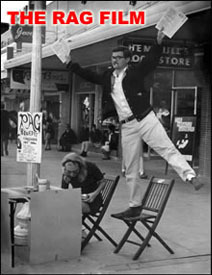 Did NACLA provide research for Fred’s paper?